This photo shows the Titanic and her sister ship, the Olympic, under construction at Belfast’s Harland & Wolff shipyards in 1910. The White Star Line first announced the names of the two ships on 22 April 1908. The impetus for naming the Olympic seems obvious – it was just five days until the opening ceremony of the 1908 Olympic Games in London. In fact, the name officially referred to the Greek gods of Mount Olympus – the pantheon of Zeus, Hera, Aphrodite, and so on. In Greek myth, those gods came to power by subduing the mighty immortal Titans, who had ruled in the preceding Golden Age. Hence the name Titanic. 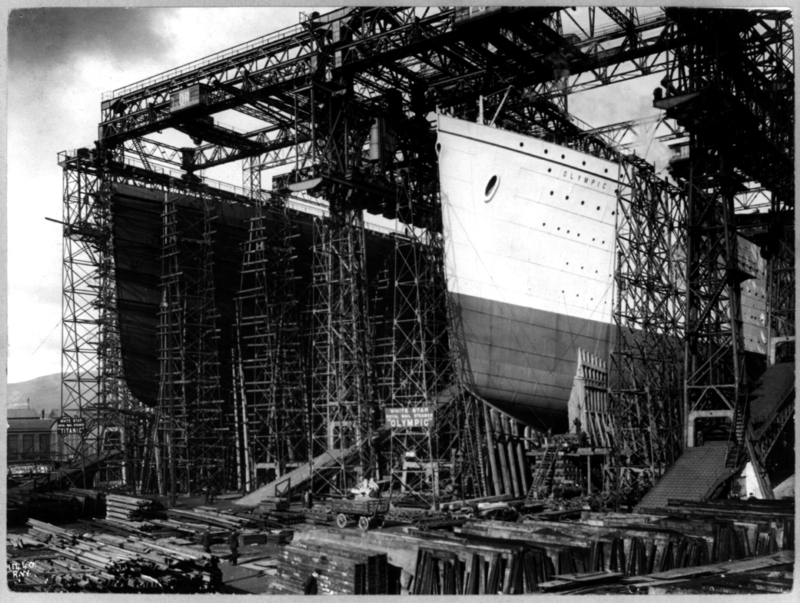 The Olympic and the Titanic also had a younger sister, work on which had barely started when the Titanic went down. Despite subsequent denials, historians generally agree that this third ship was originally destined to be called the Gigantic – in Greek mythology, the Giants, or Gigantes, were yet another race of gods, who staged a revolt against the Olympic gods in the hope of reinstating the Titans. The name Gigantic was quietly dropped after the disaster. In 1914, with jingoism seeming a better bet than hubris, the third ship was launched as the Britannic. Every White Star ship, incidentally, was given a name ending in –ic, whereas the ships of their big rivals Cunard ended in –ia; thus Mauretania, Lusitania and so on. Previous White Star vessels had included the Traffic, the Magnetic, and the Arabic. When RMS Cedric was launched in 1903, she was, like the later Titanic, the largest ship in the world. You have to wonder whether the sinking of the Titanic would be quite so well remembered had disaster befallen the Cedric instead. Does James Cameron’s Cedric in 3D have quite the same ring? 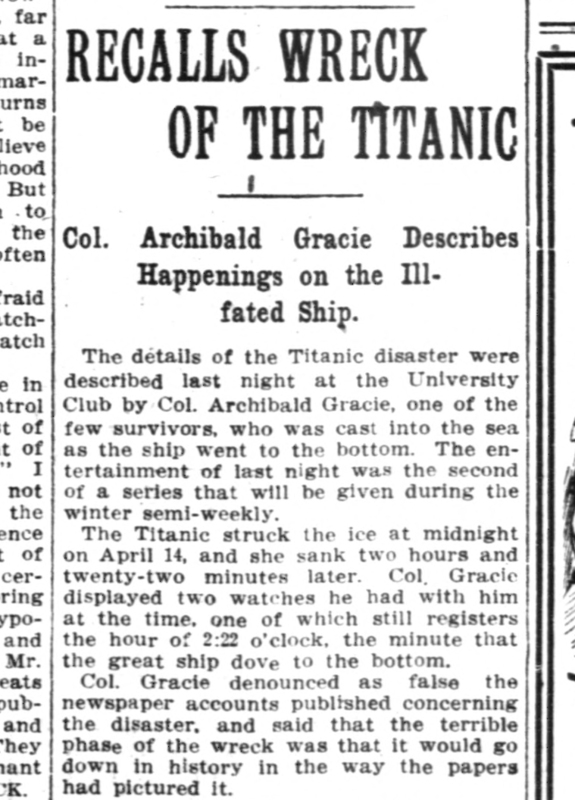 An American first-class passenger, the redoubtable Colonel Archibald Gracie, wrote the single most dramatic eyewitness account of the Titanic disaster. In his rip-roaring memoir, he described being dragged beneath the waters with the sinking ship, then fighting his way to the surface and onto an upturned lifeboat. 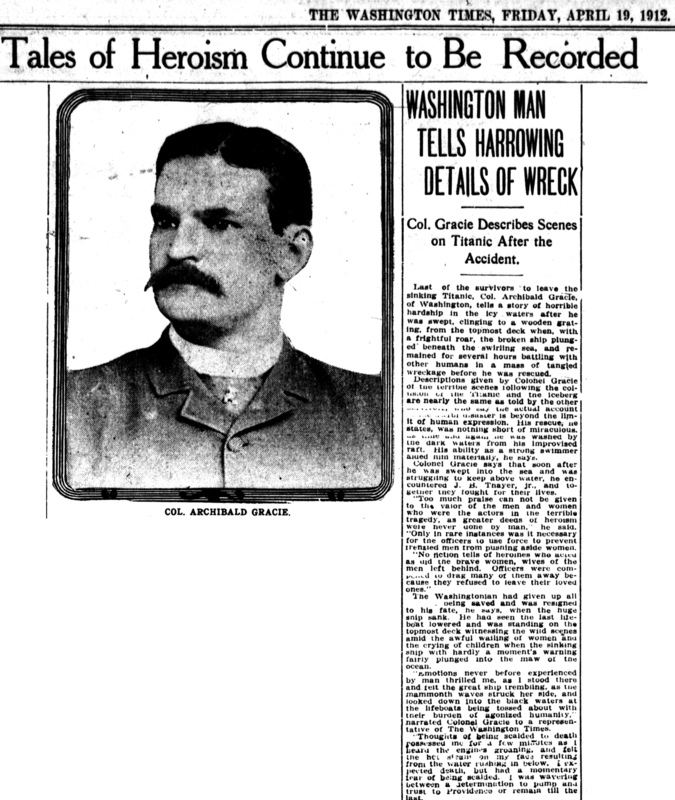 He told his story for the first time in the Washington Times of April 19, 1912 – the morning after the survivors reached New York. The tone is typically florid: “Emotions never before experienced by man thrilled me as I stood there and felt the great ship trembling”. Amid his tributes to the heroism of all concerned, though, we get the occasional glimpse of repressed panic: “only in rare instances was it necessary for the officers to use force to prevent frenzied men from pushing aside women”. In a public talk on November 24, 1912, Gracie denounced inaccurate newspaper reports of the tragedy. “The terrible phase [sic] of the wreck was that it would go down in history in the way the papers had pictured it”. He insisted for example that the Titanic’s band did not play Nearer My God To Thee, and had stopped playing long before the ship finally sank. Sadly, Gracie died just ten days later, from the lingering effects of his ordeal. His book, The Truth About the Titanic, was published posthumously the next year.